Are you the type of person who is the first to try something new, exciting and full of daredevil fun? Do you thrive on taking a big step forward when it comes to adventure? Do you get a thrill just thinking about taking that giant leap in to empty space? You have come to the right place then because our Wilderness Canyon Zip Line Canopy Tour promises all of this and more! If you have ever wanted to try zip lining, Wilderness Canyon is the place to try it. Or maybe you are already an accomplished zip liner. In that case, we would love to have you back! Wilderness Canyon stretches more than eight football fields in length and has six towers for your enjoyment. There are five zip lines that will suspend you 60 feet over the canyon. It's an experience unparalleled to any other as you see the expanse of the canyon beneath you, as you glide over it. The Wilderness Canyon Zip Line Canopy Tour is run by Experience Based Learning, a primary operator of United States Zip Lining Adventures. Zip lining tours are not run in inclement weather. The tour consists of 10 people under the guidance of two staff members who are proficient in zip lining, as well as the rules and regulations. All potential zip liners need to weigh between 70 pounds and 270 pounds and helmets must be worn. 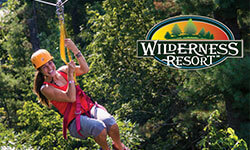 For the thrill of a lifetime, take a Wilderness Canyon Zip Line adventure today and talk about it for years to come!